Alice's Further Adventures in Wonderland was written by crack team Paul Harkin & Martin Dennett and published in the April 2000 issue of the newsletter. It tells the story of Alice returning to Wonderland for more bizarre adventures. Nine pages of text and a full colour A3 illustration helped the reader to piece the clues together, and enabled them to find a casket that had been buried with instructions of how to claim the treasure. 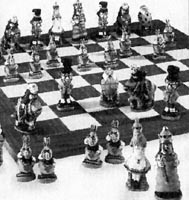 The treasure for this hunt was a unique hand painted Alice in Wonderland chess set and board. 'Alice' was solved in September 2000 by Deborah Hatton, the prize was located near the pyramid triangulation pillar at Mount Country Park in Hampshire. Oddly, a buried red herring for this hunt was not found until later - August 2001 - also by Deborah Hatton, in the village of Sellack, Herefordshire.